From our team: Our friend Katie is just one of thousands affected by Hurricane Harvey. As you read her story, please pray for both believers and unbelievers who need gospel hope and practical help in southeast Texas. Consider also . . . perhaps the Lord wants you to be an answer to your own prayers. 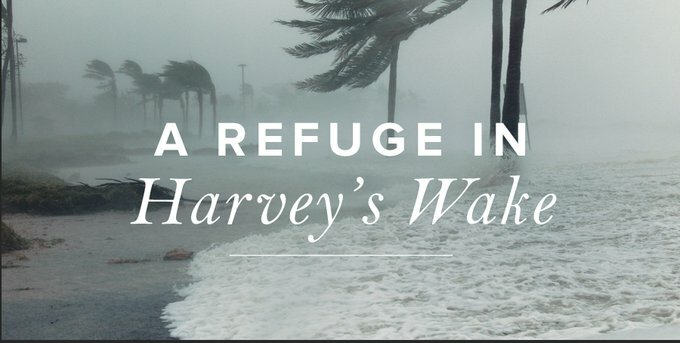 There are many great organizations taking Jesus to the streets in that area, but if you need a place to start, Houston’s First Baptist Church (where Katie attends) is collecting donations and mobilizing volunteers to help their community. To learn more, volunteer, or donate, visit this link. Before Hurricane Harvey arrived in Houston, I hadn’t paid much attention to the piece of paper that’s been hanging in my grandparents’ beach house since August 18, 1983. The paper, now faded and framed, has been kept on wood-paneled walls in their living room in Galveston, a few streets away from the Gulf of Mexico. My brothers and I were raised in those waves, practically born with seawater in our blood and boogie boards under our arms. We never had any reason to be afraid of the water, even as our parents made us aware of the kind of rip currents that can render a strong person powerless. The ferocity of the open water was simply not on our radar; it was represented only in the brown and white photographs my grandparents had framed above their television. The series of 3x5 shots showed the aftermath of Hurricane Alicia, during which tornadoes tossed aside the roof of the house as though it were made of cardboard. the seas, the wind, the rain . . . Growing up on the Gulf Coast, my favorite glimpses of the Creator always came when the sun began to set, when there was just enough light to wander through the fields of wildflowers lining the path to the water. In the moment when dusk turned to darkness, my friends and I would pass around flashlights and point them at hermit crabs hurrying across the sand, scrambling out of holes, and scurrying to find new homes. I thought about the hermit crabs the night that Hurricane Harvey arrived in Texas. My roommate had come home with waffle fries and bags filled with flashlights and candles, several sacrilegiously painted with the face of Jesus on the glass. We watched the news as Rockport and Corpus Christi were slammed with winds as the hurricane made landfall. It was the first night I heard helicopters flying overhead, their spotlights illuminating the paths of people running for shelter. Twelve hours later, my roommate and I were the ones receiving messages warning us that water was rising and that we needed to pack bags and prepare to evacuate. As our local meteorologist looked into the camera and said, “Lord, have mercy,” my roommate and I prayed together, surrendering our hearts to the God who reigns sovereignly over the wind and waves. Then we picked up what was left on the floor and unplugged all electronics and propped up our couch on cans of coconut milk. Water entered our home, and we ran through hallways, sloshing brown water into bedrooms, throwing every towel and sheet and blanket we owned at the baseboards. When we knew it was useless to continue wringing out water, we sat down on dirty floors muddied with debris and begged God to stop the rain. We rejoiced when, days later, He did. When my street drained to the point that we could safely open the door without water coming in, I pulled yellow rain boots back on and walked to Brays Bayou, one of the slow-moving, marshy rivers that weaves throughout neighborhoods near the Texas Medical Center and Rice University, not too far from downtown. The earliest storm predictions had anticipated that this bayou would overflow its banks and flood nearby homes, but on the first night, it was still startling to hear that water had risen ten feet in one hour. As the bayou spilled over its banks into my subdivision, just enough water entered our home to force us to throw out furniture and much of our flooring. Although my roommates and I have had to find other places to stay, we are far better off than the majority of our friends, family members, and neighbors nearby, who have lost everything. Evidence of this is out on front lawns all over the city. Sidewalks have become a wall of floorboards and insulation and sheetrock, rotting and reeking of mold; a wall of carpet and couches and dining room tables; a wall where wet teddy bears top off the trash. Almost a week has passed, and helicopters continue to fly over the bayou. Some are still dropping baskets down in order to save people, but at this point, most are attempting to measure the amount of loss with wide-angle shots of the area. Their footage reminds me of my grandparents’ photographs. The same faded brown and white haze seems to have fallen over the city; from above, all that can be seen is water. News updates continue to be shared in a compressed way: a series of calamities coming one after the other. The reporting style has made me think of the opening chapter of Job. The worst news of Job’s life is narrated in rapid succession, summarized in a few short verses. It’s as though the camera stays focused on the news desk, delivering the devastating facts before finally turning to Job to see how it registers with him. In 1:20, Job responds. He stands up, tears his robe, and shaves his head. He falls to the ground and worships. This week, organizations and individuals raising support for survivors have used the slogan “Houston Pride” to unite their fundraising efforts. I love my hometown, but I have had a hard time hashtagging “Houston Pride” because this hurricane has humbled so many of us. It has brought us to our knees before the throne of God, asking Him for grace to submit to His reign in the midst of suffering we simply do not understand. So much devastation has already occurred, and the aftermath of a hurricane can often be more destructive than the storm itself. When demolition occurs and walls are stripped away, damp water becomes the breeding ground for mosquitoes and mold spores to spread. Buckets and buckets of bleach have been brought into the city in recent days, and clean-up efforts are currently focused on keeping dangerous mycotoxins out of the air. But more than mold, I fear the contamination of bitterness into our atmosphere. Praise God that it has been kept at bay as the Body of Christ has poured into Houston from all over the United States. Christians have sent supplies and they have sent their people, and their presence has infused hope and joy into every part of this city. When these precious servants return to their own hometowns, pray that we will not forget the compassion and grace God has shown us through each one of them. Pray for our hearts and for our hope, for our city to be rebuilt on the foundation of Jesus Christ. Join us in praising God, for as we have witnessed here in Houston, when the Lord is the saving refuge of the state, there is no strength like “Texas Strong.” There is no faithfulness like our God’s. The last lines of the poem hanging in the beach house do not promise a future without storms; in the three decades since these words were penned, they have only worsened. But we who have been rescued by Christ have a shelter in the Most High, a refuge and fortress, in whom we can trust. To all our needs attend.